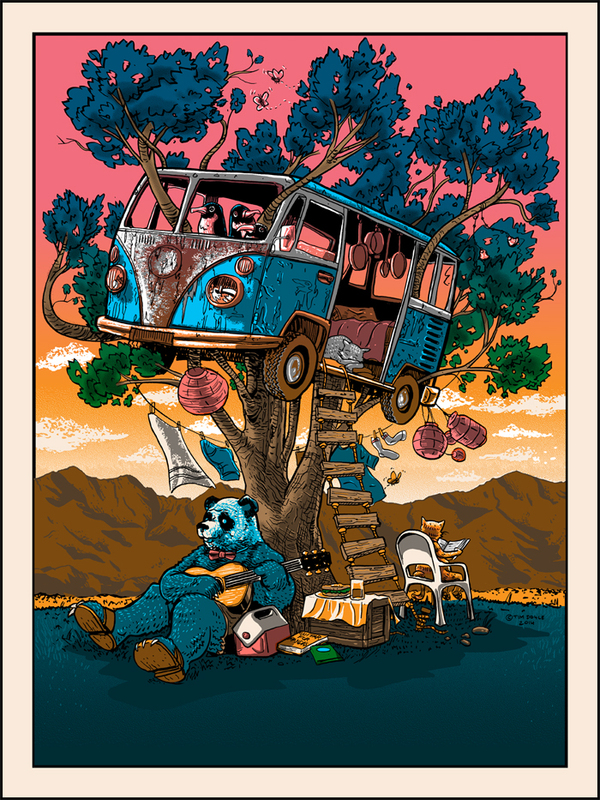 “Guitar for Pandas” art print by Tim Doyle! Originally commissioned by the Coachella music festival for use as a poster at the show, the art from that sold-out poster is now available as a limited edition silkscreen print! This print, measuring 18×24 is signed and numbered by Doyle in a first edition of 150. 6 colors, hand-printed, and featuring a lush split fountain in the sky over the mountains of Indio, California- where the festival is held! Recurring Doyle-print characters like the Panda (from Vietnam on Wheels) and the Bad Cats- Ringo and Pickles (first appearing in ‘The Camino Cats Make Their Escape‘) as well as the Penguin travelers from ‘Northbound Whale‘ all make a return here, enjoying a quiet moment in the sun. This print is currently in production, and should ship within 10 days of order placement!